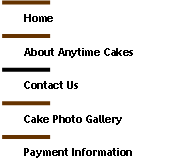 Are you interested in purchasing a beautifully decorated cake for your upcoming event? Please send me an email and tell me a little about what you’re looking for, and I’ll contact you to discuss the details!! If you prefer, you can also call me and leave a message on my answering machine — I will get back to you as soon as I can!! FYI: I am located in the Northern Virginia area, and while the majority of my clients are within a 25 mile radius of my home in Reston, I have delivered wedding cakes to Richmond and even West Virginia. Please contact me to discuss possible delivery options and fees.